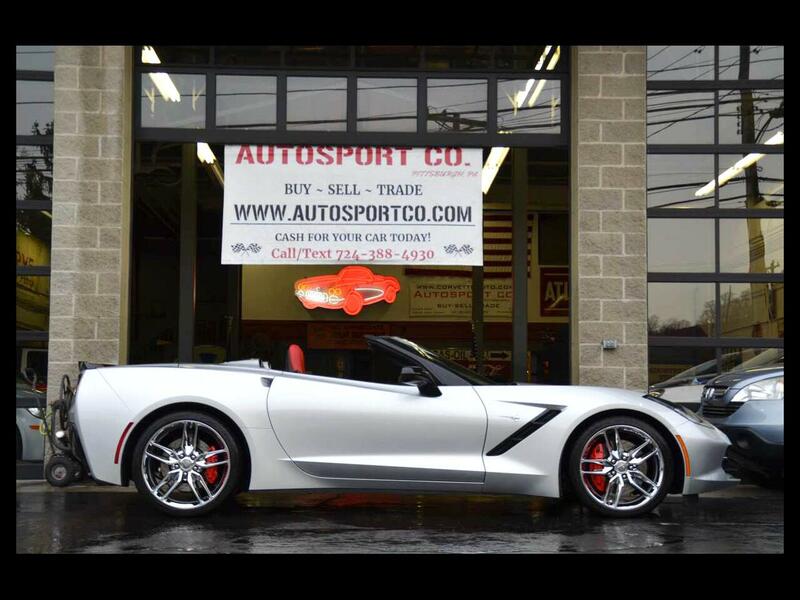 Used 2014 Chevrolet Corvette Stingray Z51 3LT Convertible for Sale in Indiana PA 15701 AutoSport Co. Offered for sale is a stunning, Clean AutoCheck, 2014 Chevrolet Corvette Convertible 3LT with the factory upgraded Z51 Performance Package, over $15,000 in factory upgrades and only 13K miles. This 2014 Corvette has a 6.2L V8 powerhouse under the hood that runs and sounds incredible going down the road and is sure to impress! The Blade Silver Metallic paint is in like new condition with very minimal wear present had a 3M clear bra installed when purchased to protect from all road grime; likewise, the Chrome Aluminum Wheels show excellent and show very minimal signs of wear. The black power convertible top is in excellent condition and functions properly without issue. As if you haven’t already noticed, this Corvette has an outstanding color combination and looks like a totally different car whether the top is up or down. The adrenaline red leather interior is in like new condition and really makes this car stand out from the rest! In addition this 2014 Chevrolet Corvette with only 13k miles is equipped with options such as: Clean AutoCheck, 6.2L V8/Automatic Transmission, Z51 Performance Package, 3LT Package, Heated and Ventilated Leather Seats, Factory Navigation, Factory Backup Camera, Heads up Display, Power Convertible Top, Carbon Flash Painted Spoiler and Outside Mirrors, Multi-Mode Performance Exhaust, Chrome Aluminum Wheels, Premium Bose Stereo System, MYLINK System, Magnetic Ride Control, Painted Calipers, Original Window Sticker and Build Sheet, Original Owners manuals, both sets of keys, current PA inspections and much more!!! For more information on this 2014 Chevrolet Corvette with only 13k miles feel free to call/text Anthony at 724-388-4930. We accept trades and can help with financing options. This car is located at our Pittsburgh location, we look forward to speaking with you. This car is on consignment so please call ahead just incase the vehicle is not on sight. Thank you!